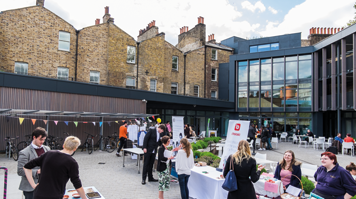 London South Bank University (LSBU) will be hosting free tours of its award-winning Clarence Centre for Enterprise and Innovation on 19 September as part of this year’s Open House London, the capital’s largest annual festival of architecture and design. Opened in 2014, the Clarence Centre is the heart of a community of start-ups, student entrepreneurs, local SMEs and LSBU’s Research, Enterprise and Innovation team. The Centre plays an influential role in shaping the local community by offering office space, business support services, legal advice and training events to local businesses. Located on Southwark’s historic St George’s Circus, the building was originally a run of 17 derelict Grade II-listed Georgian terrace houses and the Duke of Clarence pub. LSBU worked with London-based architects Rivington Street Studio to fully refurbish the dilapidated buildings to an extremely high, contemporary standard while maintaining a link to the building’s heritage by keeping original features, such as fireplaces. The Clarence Centre’s important role in regenerating the local area has been acknowledged by a prestigious 2015 Royal Institute of Chartered Surveys’ (RICS) Regeneration Award and a commendation in the 2014 Civic Trust Awards. "The project has transformed these heritage buildings and brought them back into use as start-up units for small businesses, helping the overall regeneration process in the wider area. Set around an attractive courtyard, the Clarence Centre forms a physical link between the university and the changes now taking place in the wider Southwark area," said the RICS judges' official statement. The Clarence Centre will be running regular tours on Saturday 19 September from 10am to 4pm. Get more details on the Open House London website.